Waste radiator is a kind of worn electrical appliances which are known as electrical rubbish. They contain valuable metal resources like gold,silver,copper,alumium,tin,etc. that have high value in use. However, if the waste electrical appliances aren’t processed appropiately, they can directly hazard people health as well as badly pollute the earth,water. To our worrying, only less than 10% are processed scitifically among the huge quantity electrical appliances. Therefore, recycle electrical rubbish has a significant benefit on the temporary era and the future generations. This is automatic radiator recycling production line with voltage of 380V/10kw; It is quite suitable to recycling large quantity of electric appliance at a time; the separating rate can reach 99.5%. The production capacity can reach to 600-800 kg/h. 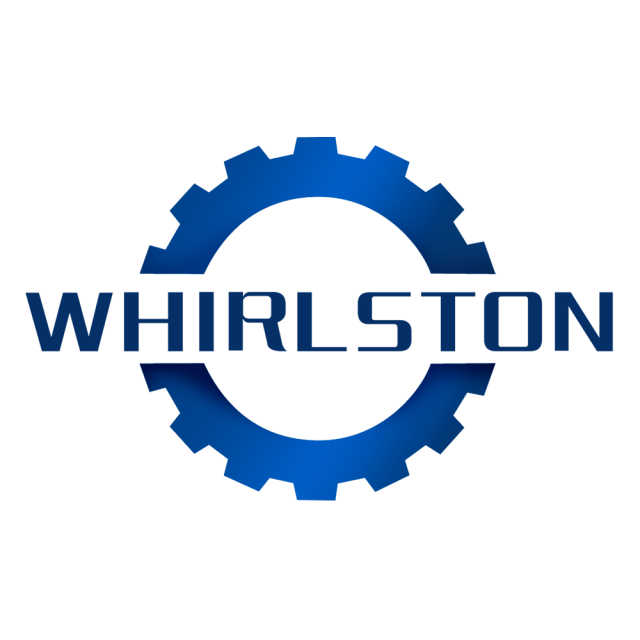 The whole production line has unique structure, big process capacity. Controlled by PLC, the separation is conducted by several parts. It has automatic shutdown and overload automatic alarm device. This successful production line is greatly to liberate the productivity and also improved the recycling quality of the Copper and Aluminum. 1. 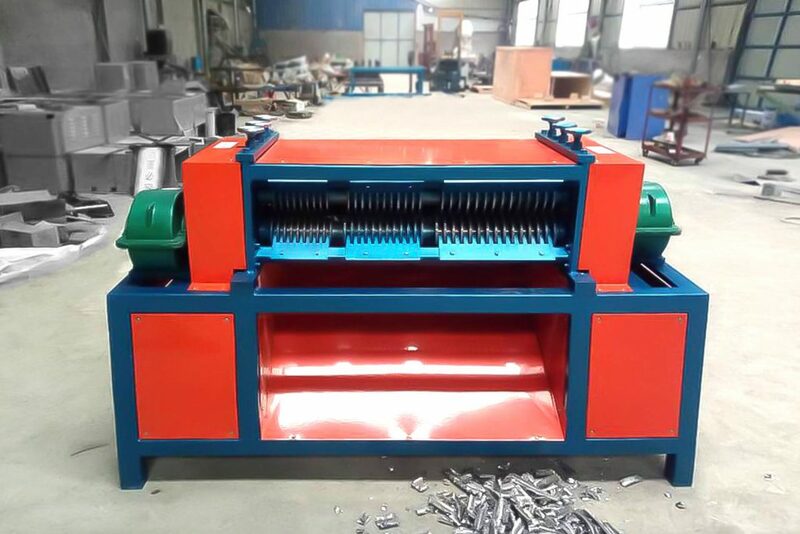 Belt Conveyor: connect the whole line and convey waste radiators to crusher. 2. 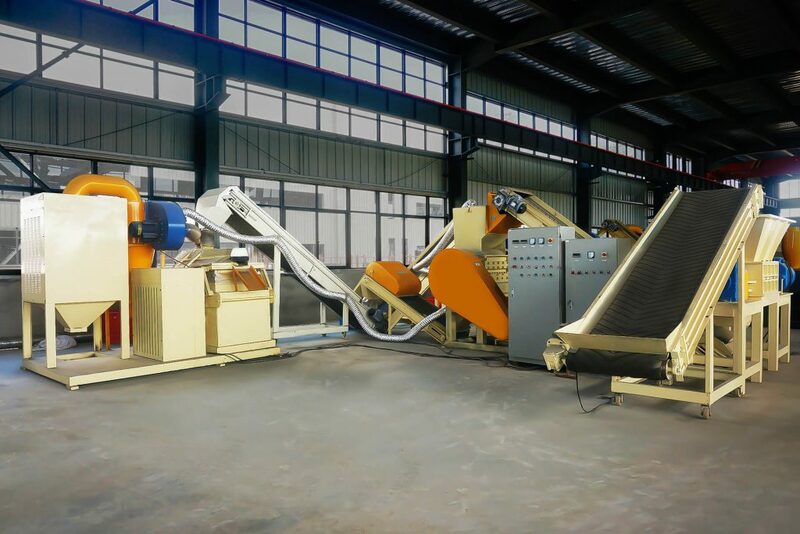 First Crusher (Two-shaft Crusher): to crush radiators to 10-20mm pieces, then the crushed material is transported by the conveyor to the second crusher. 3. Belt Conveyor: to transfer the first crushed materials for the second crushing. 4. Second Crusher: After transported to this crusher, the 10-20mm material is shredded by this crusher to smaller pieces. 5. Magnetic Separator: to separate iron from copper and aluminum, so that copper and aluminum can be separated easily. 6. Vibrating Separator: to separate copper pieces from aluminum pieces. It is devoted to cut radiators of air conditioners and separate copper pipes from aluminum with a production output of 2-3 TONS per DAY. It can be structured into two types: the small type and the combined type. To fit for small type, you should classify radiators, remove the installing rack, adjust the internal; all these are done by hand; Our radiator recycling machine can strip one layer and two layers radiators. When radiators are more than 2 layers, a band saw is needed to cut them into one layer or two layers. High efficiency. Separate copper pipes from alumium foil at high speed,no damage to copper pipes. Wide application. Suitable to old electrical appliance recycling center,air conditioner recycling place,etc. Automatic recycling instead of labor working, low electricity consumption and noise. 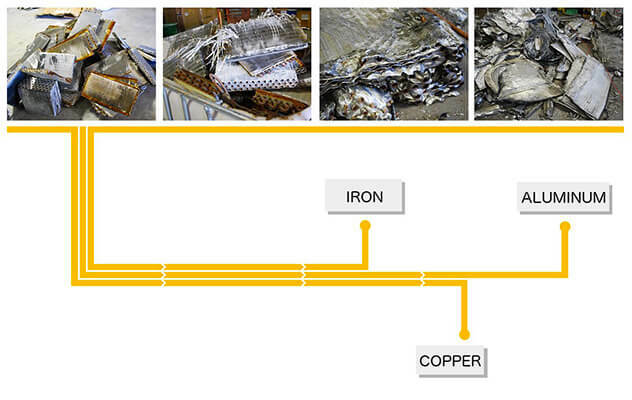 How does Radiator Recycling Machine Work? then put these cut radiators to the feeder smoothly for stripping.